It's with a certain amount of pride that I note today that 2000 and eight is the 40th Anniversary of the Sealed Knot, a historical re-enactment society named after a secret society of the 17th Century, whose aim was to restore the monarchy after the English Civil War of 1645 and the beheading of King Charles the 1st. 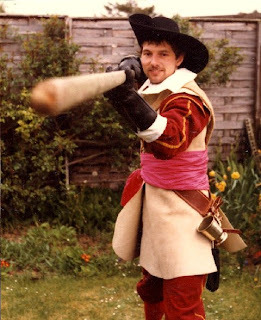 and so it was, that in 1981, this deep-seated quirk in men..combined with my love of history, curiosity in time-travel, and beer, I discovered the society and found there were legal ways, that one could have a massive punch up, dressed in historical clothing. You had a battle dress and also a costume for going out in the evening. The massive Fights were only sketchily , choreographed, and were again as real as you could get without being actually killed. 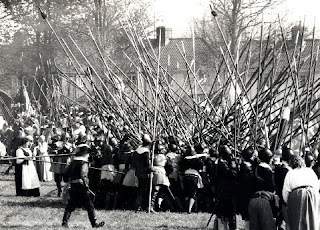 Cannon, Musket , Cavalry, explosions in the ground and Pike Pushes to protect the Standard..... I could go on, but I could really sum it up in that eventually I had to call it a day after a few years..., because I couldn't get insurance....and was forever injured with cracked ribs and covered in bad bruises. So tonight I will seek out my old Pewter tankard, and fill it full of Old Hooky Ale, and raise the mug to the oak beamed ceilings of a pub, and give a big hearty cheer to all those in the Sealed Knot, who still learn the lessons for today from the people of the past....and maybe I'll show a few folk my scars. My re-enacting goes back to only the late 18th Century in the pioneer Indiana Territory. Musket, Throwing Ax, and Knife (no pike staffs). There are always lessons for us to learn. Enjoy. Seal the Deal...Tie the Knot...Beer, Fighting and Fun! I couldn't touch that with an 18 foot pole! Push on my Warrior Knights! The cannon were the most interesting things... at the beginning of the battle, the gunners would have a pile of wadding and paper bundles they would stuff down the bore and fire in conjuntion with ground explosives( FX for the crowds ) that were triggered when the cannon went off. These were marked on the ground and it was a wise man to steer a little clear of the marks.